The 2018 Annual Conference is abounding with educational and networking opportunities you don’t want to miss. This year, the Annual Conference will feature 8 pre- and post-conference sessions, workshops and tours. 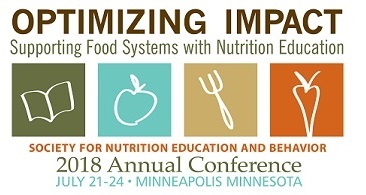 The pre-conference schedule begins on Saturday, July 21 with an extensive 7-hour workshop hosted by the Division of Food and Nutrition Extension Education. The day ends with a workshop that will demonstrate how to implement social media and paid social media promotion to take your marketing outreach to the next level. To learn more about these sessions and view the full conference schedule, visit www.sneb.org/2018. SNEB is in the process of authoring its first position paper. The current paper in review is on sustainability within the dietary guidelines. In order to be inclusive of the expertise and viewpoints of the entire membership, the process gives members the opportunity to review and submit comments to the authors through an online review form. Comments will be compiled and evaluated by a working group of the JNEB Position Papers Subcommittee before being communicated to the paper's authors. The deadline for member comments is Thursday, April 12. If you have questions about the process or are unable to access the links, please contact the SNEB office at info@sneb.org. Important: This paper is a draft and should not be distributed or shared. Review Paper and Comment. To recognize the efforts of others to shape and promote policies that promote health or healthy lifestyles, the Society for Nutrition Education and Behavior's Advisory Committee on Public Policy sponsors "Health Promotion Policy" awards. These awards will be given to individuals or groups who have significantly contributed to creating and/or implementing policies or policy-based changes that support and positively impact the food and/or physical activity environment. One annual Outstanding Health Promotion Policy Award will be selected from all of the bestowed awards from the year and will be presented at the annual conference. Since the early days of SNEB, there has been support among the membership for the Society to take an active role in educating members about nutrition policy. The membership has supported establishing and maintaining an active public policy program. The resolutions process is one of the mechanisms for members, or groups of members, to bring forth policy positions for discussion and vote by the membership. Resolutions provide a route for members to propose that SNEB adopt a position, take an action, or endorse a policy or principles in a formal manner. Learn more about the resolutions process. To recognize the excellence of our members' contributions to public health nutrition, four awards will be made by the division. Two awards will be made for contributions to Public Health Nutrition research by outstanding student researchers, and two awards for outstanding Public Health Nutrition practitioners/researchers. Awards are available only to SNEB Public Health Nutrition Division members. Members may nominate themselves or other division members. All applications must be received no later than April 1, 2018. An Action Alert was submitted by the SNEB Advisory Committee on Public Policy and approved by the SNEB Board. ACPP is asking SNEB members to add their name in support of "Standing in Unity for Nutrition." Please add your name in the comments as a supporter of this statement. Comments are only open to members of SNEB. Read Alert and Comment. Applications are still being accepted for the 2018 Food and Nutrition Extension Education (FNEE) Division Student Scholarship. The goal of the SNEB FNEE Student Scholarship Program is to provide financial assistance to attend the FNEE Pre-Conference and SNEB Annual Conference. To be eligible for this Scholarship, the applicant must be a senior undergraduate, graduate or international student enrolled in a United States or international degree program in nutrition, family and consumer sciences, public health, health education, community health or closely related field. The application form and essay must be submitted by April 1, 2018. The Summer Electronic Benefits Transfer for Children (SEBTC) has been proposed as a solution to address the problem of child food security during the summer. Initial SEBTC findings from a demonstration project show promise and the federal government has approved substantial funding for its continuation. This presentation will review empirical assessments of SEBTC and Electronic Benefits Transfer research, and present policy considerations in the program's future expansion. Participants will develop an understanding of the problem of underuse of the USDA Summer Food Service Program and the potential of the Summer Electronic Benefit Transfer for Children (SEBTC) program to address summer food insecurity among underserved children. Participants will develop an understanding of the results from empirical assessments of the SEBTC demonstration project and pertinent peer-reviewed EBT literature. Participants will develop an understanding of the important policy considerations in the future expansion of the SEBTC. Healthcare professionals are the top trusted and most relied upon source for information on nutrition. Still, research shows that most healthcare professionals, including physicians, receive little to no nutrition training. Nutrition educators have the opportunity to harness the public's trust and reliance on health professionals to increase the impact and reach of nutrition education programs. This webinar will highlight successful nutrition education programs for healthcare professionals, and equip participants with proven strategies to more effectively engage this group with nutrition content. The session will begin with an overview of recent consumer research that examines the public’s trust in healthcare professionals as a source of nutrition information. Dr. Kohlmeier and Dr. Sherman will discuss the current state of nutrition education in medical school and share best practices for educating healthcare professionals about nutrition topics. They will highlight various channels and ways to reach future doctors, and answer participants' questions. Understand the current state of nutrition education for physicians and other healthcare professionals. Learn from successful programs that engage healthcare professionals with food and nutrition content. Highlight partnership opportunities that can increase the impact of nutrition interventions, both individually and in community settings. This presentation describes how the cultural views of cultural diversity have influenced how nutrition educators have been trained in cultural competence and how this training needs to change because of the changing demographics of the US population. It explores how these views are changing in reaction to the changing demographics and health disparities seen in the US today and how the cultural training of nutrition educators has not kept up with these changing views. Suggestions for how this cultural education could be modified include placing a greater emphasis on both the cultural self-awareness of nutrition educators and the sociopolitical historical factors that influence the cultural orientation of nutrition educators and their clients. Describe how the description of cultural diversity in the US has shifted from being viewed as a 'melting pot' to a 'salad bowl' and how this has affected the cultural education of nutrition educators. Identify why it is important for nutrition educators and health professionals to learn about their own cultural and ethnic background and become more self-aware as cultural beings. List the core elements in creating cultural education for nutrition educators that is aligned to today's changing U.S. demographics. With a farm bill on the horizon, now is a critical time for SNEB members to let their members of Congress know about the importance of supporting nutrition education in this legislation. From EFNEP, to SNAP-Ed, to local food promotion programs, to nutrition research, the farm bill authorizes many initiatives that help people eat well. Join forces with colleagues from The Academy of Nutrition and Dietetics, the American Society for Nutrition, and the Food Trust for a day on the Hill. Share stories with your elected officials about the impact of these programs for their constituents. Let's show Congress that nutrition education matters and needs to be protected! Breastfeeding disparities exist in the U.S., with African American, adolescent mothers having the lowest breastfeeding rates. This presentation describes the process of developing, implementing, and evaluating a culturally-tailored breastfeeding program on African American, adolescent mothers in Champaign County, Illinois. A breastfeeding needs assessment, process evaluation, and impact evaluation will be discussed. Identify a barrier to breastfeeding among African American, adolescent mothers that you did not previously know. Understand the reasoning for conducting a process evaluation. 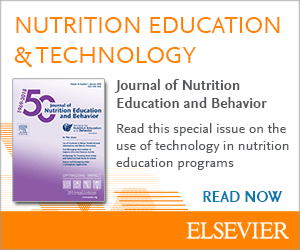 Jody S. Nicholson, PhD; Jennifer M. Barton, MS; and Ali L. Simons, BS Interview: Jody S. Nicholson, PhD, reports on a new study in which preschoolers who learned how to classify food as healthy or unhealthy were more likely to say they would choose healthy food as a snack. Successful preschool nutrition education programs should simplify information into developmentally appropriate concepts. The MDR is a thought leadership conference with scientists, food industry experts, high volume food service operators, nutrition & wellness experts, and opinion leaders discussing dietary trends in America. Gain a deep understanding of the health values, commercial benefits & market trends in our dynamic, informative and interactive event! SNEB members receive a $100 discount by using code MDR4SNEB at checkout.